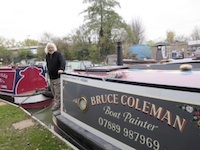 A significant part of the the Oxford Canal Heritage project has been the collection of memories from people who have lived and worked on the canal in past times, of present day boaters who live and work from residential canal boats and from others with particular interests and connections to the Oxford Canal. These voices provide an authentic picture of life on the canal both past and present. Philip talks about the Northern Lights, the first of his Dark Materials trilogy, which begins in Oxford and describes the escapades of Lyra with the ‘Gyptians. These water travellers bear more than a passing resemblance to working boaters as they too use the canals for travel and trade but Philip feels that they were not directly borrowed from local history but resulted from weaving together mythology and traditions. Although he was at university in Oxford, Philip admits to not being terribly aware of the canal given his studies and other pursuits. However after living, working and writing in the city he talks about his involvement in the community protests that followed the sale of the Jericho boatyard site to developers and his chagrin at the activities of the City Council. 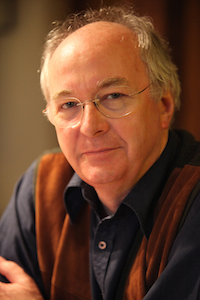 Listen to more of this interview with Philip Pullman at the Oxfordshire History Centre. Michael Stockford Michael was born in the plough at Wolvercote in 1931 and has written 2 books: Growing up in Wolvercote 1931-51 which sold out and was followed by 'THEM AND US Memories of Upper and Lower Wolvercote 1900 -1980'. The ‘them and us’ in the title refers to the Wolvercote community divided by the railway and the Canal. Michael could see both from his bedroom window as he was growing up and his interest, nay passion has never dimmed. In his interview, Michael shared his memories of the boaters who used to tie up on the Oxford canal at the bottom of the Green. He observed that they kept themselves to themselves and rarely came into the pub itself. Young boys, probably teenagers or younger, would be sent to buy a jug of ale for the men. A boy would come to have their jug filled after which a piece of paper or similar was stuck over the mouth of the jug so that the adult receiving it could be confident that the carrier had not taken a drink en route! Hear more of Michael’s meticulous memories at the Oxfordshire History Centre. We are grateful to for the help and previous work of local historians, Mark Davies and Catherine Robinson in this project. 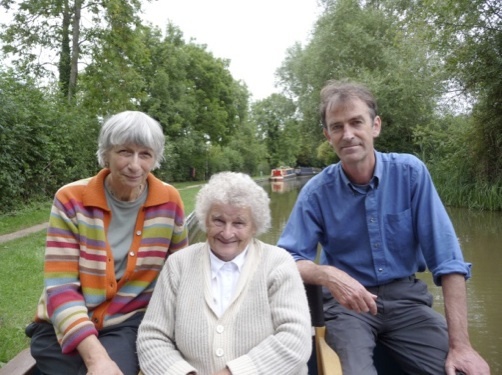 Mark and Catherine used oral history to gather material for their books Our Canal in Oxford: Along the Towpath from Wolvercote to Jericho and the City (1998) and A Towpath walk in Oxford: the Canal and the River Thames between Wolvercote and the City (2012). Both books which are available from the Towpath Press are an invaluable source of information about the history of the Oxford Canal and the lives of working people such as Rose Skinner and canal trade.